A US high school has introduced sporty hijabs for its female Muslim athletes in order to help them feel more comfortable while taking part in sports. Deering High School in Portland, Maine, has introduced the lightweight headscarves, which cover the hair of practicing Muslims, as an alternative to the traditionally more bulky hijab which can pose problems such as falling off while running. The school is the first in the US to provide its students with the headscarves to boost participation of Muslim girls in sport. “We’re more confident on the field. This one doesn’t fall off. No matter what I do, it won’t fall off,” Deering junior lacrosse player Fadumo Adan said, the Associated Press reported. On May 4, the International Basketball Federation (FIBA) altered its rules to allow players to wear religious headgear during games. Fencer Ibtihaj Muhammad became the first American to compete at the Olympics while wearing a hijab, when she won a bronze medal at the 2016 Rio Games. 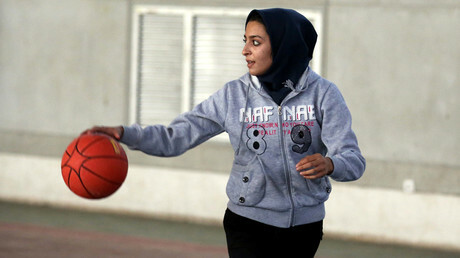 Hijabs have however caused some controversy in sport. In February, 18-year-old Iranian chess grandmaster Dorsa Derakhshani was banned from competing for the national chess team for not wearing a hijab – obligatory dress for women under Iranian law. Derakhshani was expelled for not covering her hair with the garment – compulsory for women since the Islamic Revolution in 1979 – while competing as an independent player in the 2017 Tradewise Gibraltar Chess Festival. Then in April, Iranian soccer player Shiva Amini was dropped from her country’s national team for not wearing a hijab in an exhibition game while on a tour of Switzerland and Italy.